(ADULT / PARENTAL SUPERVISION AND ASSISTANCE REQUIRED) This craft is for older children or teens that have an adult with them to assistast or supervise. This would be a great craft for Middle School or High School shop class or for a Summer Camp project. 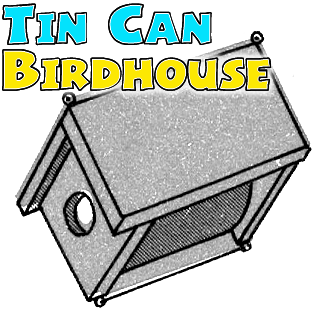 With this craft you are incorporating a tin can with a wooden bird house...find out how to make it below. 1. Remove top from medium-sized can and remove contents. Wash and dry. 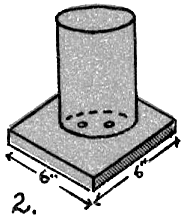 With hammer and nail, punch two holes in bottom of can, as in Figure 1. 2. Center can on a 6" x 6" wood square, and from inside the can, fasten can to wood with 3/4" screws, as in Figure 2. 3. 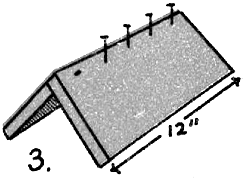 Nail two pieces of wood, 8" x 12", in a peak for the roof, as in Figure 3. 4. Take another 6" x 6" wood square, and cut a hole in the center with a coping saw, (Page 27) as in Figure 4. 5. 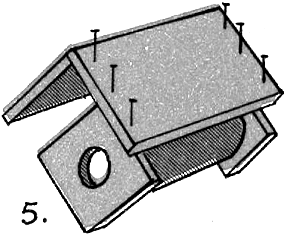 Place square with hole against open end of can, and place the other square at the closed end, Set peaked roof over can, and nail roof to both wood squares, as in Figure 5. 6. 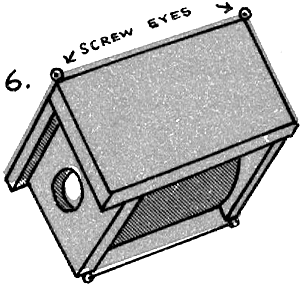 Insert two screw eyes at corners of roof (A and B) and two screw eyes at bottom of birdhouse (C and D). Draw piece of wire through two lower screw eyes, and fasten, for perch, as in Figure 6.